It is a real pleasure for me to visit the beautiful Jersey Island and join you in this magnificent building this evening. On behalf of my wife and my colleagues, I want to thank you for your very warm welcome and gracious hospitality. Previously I have been to the Isle of Man and Guernsey Island. Jersey is the last stop of my visit to the three major Crown Dependencies. Last but not least, this is in fact a long-awaited trip for me. In the past two days, I have much admired the natural beauty of Jersey. I also visited Hautlieu School and the Jersey Dairy Headquarters. This has given me a taste of the abundance in all aspects of life in Jersey from industry to leisure. More importantly, I had productive talks with Deputy Bailiff Bailhache, Chief Minister Gorst, Lieutenant-Governor McColl and other leading officials of Jersey. Overall this programme has been both substantial and stimulating, which gives me every confidence in the success of my visit. I have come to Jersey with three goals. First, increase mutual understanding and deepen friendship. Among all Crown Dependencies, Jersey has closest ties with China and most frequent contacts with the Chinese Embassy in London. During my time in London as Ambassador I have met Jersey guests four times in the Embassy. The leading guest on three of such occasions was Chief Minister Gorst. I am here to meet with people I can describe as good old friends. But, just as important, I want to make new friends here. I also hope this visit to Jersey will help build deeper understanding on both sides and lay a solid foundation for our broader exchanges in the future. Second, heighten our practical cooperation. With efforts from both sides, China-Jersey cooperation has made smooth progress. Both China Banking Regulatory Commission and China Securities Regulatory Commission have concluded MOU with the Jersey Financial Services Commission regarding regulatory cooperation. The China State Taxation Administration has also signed agreement with Jersey Government on information sharing. 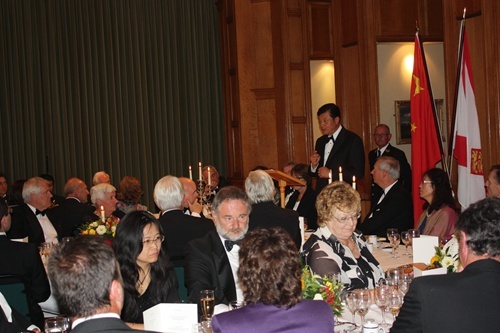 As far as I know, Jersey Island is now well known to the Chinese business community. A telling example is one third of Chinese companies listed in London are registered here. But, we can do much more. Going forward, we should strengthen cooperation in the financial and dairy sectors. This is one of the priorities of my visit. Moreover, when Chief Minister Gorst visited China earlier this year, he made proposals on boosting our cooperation in tourism, e-commerce and infrastructure. Echoing the immense enthusiasm, I have brought with me some Chinese entrepreneurs. They will work with their Jersey counterparts to translate the proposals into real actions. My third goal is to expand people-to-people and cultural exchanges. Situated between France and England, Jersey is steeped in history. Though my stay is brief, I have been fascinated by the richness of your culture. I am convinced that Jersey has enormous potential to be tapped in attracting Chinese tourists and strengthening our youth exchanges. As an old Chinese saying goes, ‘Man is a product of his environment.’ This applies not only to man, but virtually everything. Though small in area, Jersey has its own specialties unique to this island, specialties that you can certainly take pride in. The Jersey cow and Jersey Royal potatoes are highly prized throughout the world. One thing in common is like the Jersey Island, they both have small size but high quality. I once received potatoes you sent from Jersey, but never cows. Perhaps, after all a cow is too big to be sent by post. Anyhow I believe focus on quality instead of size is the knack of Jersey’s success. It should also be the focus of China-Jersey exchanges and cooperation. · To the prosperity of Jersey and the wellbeing of its people! 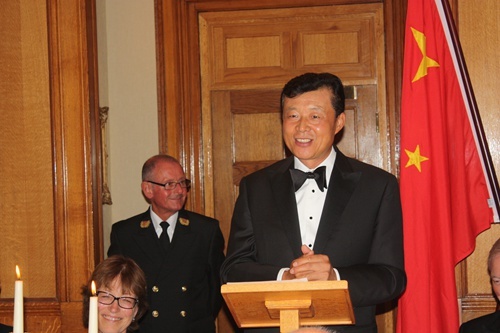 · To the continuous progress of the mutually beneficial cooperation between China and Jersey! · And to the health of all friends present!